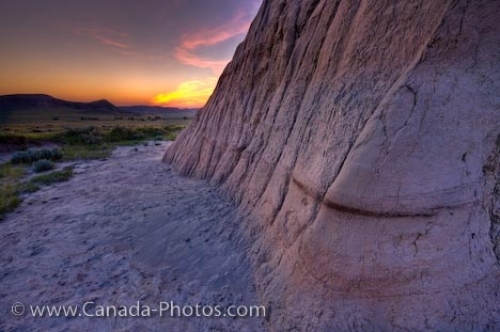 Standing at the base of Castle Butte in the Big Muddy Badlands in Saskatchewan, Canada at sunset, the landscape is illuminated by the soft yellow and pink hues spanning the sky. Castle Butte is made up of mostly sandstone and clay which has taken many years to form by the different weather patterns which sweep across the Big Muddy Badlands. In early years, Castle Butte was a well known landmark used for Indians, outlaws and the Mounted Police as a marker. Today, visitors come to the Big Muddy Badlands to explore, watch beautiful sunsets and admire the scenic landscape. Picture of the dancing clouds in an array of color at sunset from Castle Butte in the Big Muddy Badlands in Saskatchewan.